We are well aware that modern poets like Auden chose words for their denotation rather than for their connotation. They dislike all words with overtones, and prefer the flat music of the tuning fork to the reverberations of the organ. The bees in their poetical hive are always lean and hungry, stripped for action as they issue forth to their daily task, never loaded with spoil and crusted with wax and honey as they stagger home weary at evening, as Milton and the Victorian poets liked them best. Our culture loves the new, and has no problem coming up with new definitions for old words, but this means that old meanings are sometimes lost, ignored, or subverted. New words are often coined, but these usually correspond to new technology. Also, since serious writing is becoming more modeled on informal speech, rare but precise words may be ignored, while the meaning of common words become broadened. These trends can weaken language, leading to a kind of illiteracy where people are incapable of comprehending the writing of previous ages. (Some would say that this actually is the purpose of the new language: see the appendix on Newspeak in the novel 1984). I think that the word beauty is not used properly, that it has an expanded definition that goes beyond what our ancestors would have used, and that it has expanded so much that it lacks precision and therefore is less useful. If artists say that we cannot even use the word, then I'd say the word is in trouble. A reason for this is perhaps due to the loss of other words that explain things related to beauty, while not meaning quite the same thing as beauty. I would not agree that beauty is the purpose of art: portraying beauty is a high and noble purpose, but it certainly can't be art's only purpose. Artists and patrons from before the 20th century would likely have agreed that there is more than beauty that is important: even though beauty is important. A work of art could express beauty, but it could also be comic, tragic, terrifying, or sublime. For example, this painting, Der Wanderer über dem Nebelmeer, [Wanderer (or Hiker) Above the Sea of Fog], by Caspar David Friedrich, does not necessarily attempt to show only beauty, despite it being well-composed and well-executed. Rather, the artist likely wanted to express the sublime in this painting. This is not merely a pretty or beautiful landscape; the figure is standing in what appears to be a dangerous place. The word ‘sublime’ is rarely used today, and when it is used, it seems to have little meaning other than “I like it a lot, in a pretentious sort of way” But this was not always the case: in the past, this word was used to describe a sense of awe, grandeur, or greatness, something that is lofty to an extreme degree, so much so that it dwarfs the human person in insignificance. Something that is not beautiful may be sublime; and something that is sublime might also be terrifying. It is said that nowadays we find mountain ranges beautiful whereas in the past they were considered terrifying. It is said that young English aristocracy, when the fashion of going on the Grand Tour of Europe was first started, would often close the shades in their carriages while traveling in the Italian mountains because they were frightened by the view. It is said that due to the Romantic Movement in the 19th century, including paintings like the one above, we no longer find mountains objects of terror, but rather objects of beauty. But I find this explanation dissatisfying, because it fails to describe the mountains as they are in themselves, nor does it explain human nature in a clear way. This causes the word ‘beautiful’ to lose meaning and to be reduced to mere subjectivity. 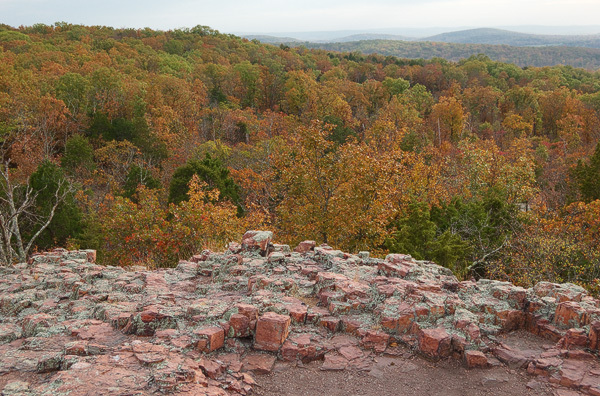 A view from the top of Hughes Mountain, in the Saint Francois range of the Ozark mountains, in Washington County, Missouri. Due to my limitations as a photographer, I have difficulty showing the sublimity I experienced at this spot; after all, painting is a higher art than photography, the painter being freer to compose his subject fittingly. Something that can inspire terror in some people or evoke beauty in others would be best called sublime, and that is what the Romantics intended. I can hardly believe that they thought that their landscapes would be terrifying to one generation and beautiful to the next due to societal evolution. These Romantics did not merely portray beauty or the mood of terror, but rather they had an understanding of the sublime, which could contain both at the same time and more. Undoubtably a flat-lander will be terrified when first traveling in mountains — no matter how many paintings or photographs he'd seen of them. Likewise, an experienced mountaineer may appreciate mountain vistas more, but would still be terrified if he lost his footing on the edge of precipice. We could instead accurately use the word sublime to describe the mountains: this would would apply to both the beginning traveler as well as the experienced mountain climber. Please note that the painting above does not show the man's face, so we are unable to easily discern if he is feeling joy or terror: but undoubtably the artist shows the man contemplating the sublime. We unfortunately have nearly lost a good and useful word, which is much applicable to the arts. The sublime is often portrayed well in cinema: imagine a giant robot rising from the ground, or the vast array of an army preparing to attack: these may or may not be beautiful or terrifying scenes, but they are certainly sublime ones. But sublimity is not often found in the other arts, and certainly not in rhetoric or serious writing. However, sublimity can be used to good effect in church architecture, to invoke a sense of awe and loftiness. Our current renewal of liturgical art emphasizes beauty by focusing on the revival of the Baroque style. This follows the classical principles of beauty, based on proportion, symmetry, harmony, and clarity of form. This emphasis on objective beauty is absolutely necessary. Liturgical artists can add to this to incorporate other aesthetics such as sublimity. Comedy and ugliness together were used to good effect in the Gothic churches, symbolizing sin and folly, particularly with the gargoyles and grotesques. Terror and horror could be found in paintings, such as the Dance of Death, and in depictions of demons pulling wicked rulers, clerics, and laymen into the maw of Hell. Including other aesthetics must be done very carefully, as artistic experimentation of recent decades has often proved disastrous or at least unedifying. But certainly the sublime, an integral part of Gothic cathedrals, is easily incorporated into the Baroque revival style. The classic work on the subject is Longinus' On the Sublime, likely written in the 1st century. This work quotes many well-known writings from antiquity, as well as surprisingly the Bible. While this book examines the sublime in literature and rhetoric, the principles and observations can be applied to the other arts as well. A lofty passage does not convince the reason of the reader, but takes him out of himself. That which is admirable ever confounds our judgment, and eclipses that which is merely reasonable or agreeable. To believe or not is usually in our own power; but the Sublime, acting with an imperious and irresistible force, sways every reader whether he will or no. Skill in invention, lucid arrangement and disposition of facts, are appreciated not by one passage, or by two, but gradually manifest themselves in the general structure of a work; but a sublime thought, if happily timed, illumines an entire subject with the vividness of a lightning-flash, and exhibits the whole power of the orator in a moment of time. Longinus (or whoever wrote the book) is writing in the Platonic tradition much esteemed by the Church, and so has many parallels with both Catholic moral and mystical theology, as well as the philosophy of art widely used in the church throughout much of her history. The sublime, he explains, raises a person out of himself, who for a moment achieves a kind of union with that which is sublime, and can see it with his mind's eye. The first question which presents itself for solution is whether there is any art which can teach sublimity or loftiness in writing. For some hold generally that there is mere delusion in attempting to reduce such subjects to technical rules. “The Sublime,” they tell us, “is born in a man, and not to be acquired by instruction; genius is the only master who can teach it. The vigorous products of nature” (such is their view) “are weakened and in every respect debased, when robbed of their flesh and blood by frigid technicalities.” But I maintain that the truth can be shown to stand otherwise in this matter. Let us look at the case in this way; Nature in her loftier and more passionate moods, while detesting all appearance of restraint, is not wont to show herself utterly wayward and reckless; and though in all cases the vital informing principle is derived from her, yet to determine the right degree and the right moment, and to contribute the precision of practice and experience, is the peculiar province of scientific method. The great passions, when left to their own blind and rash impulses without the control of reason, are in the same danger as a ship let drive at random without ballast. Often they need the spur, but sometimes also the curb. The remark of Demosthenes with regard to human life in general,—that the greatest of all blessings is to be fortunate, but next to that and equal in importance is to be well advised,—for good fortune is utterly ruined by the absence of good counsel,—may be applied to literature, if we substitute genius for fortune, and art for counsel. Then, again (and this is the most important point of all), a writer can only learn from art when he is to abandon himself to the direction of his genius. As grace perfects nature, a good education also improves nature: but grace and inspiration are more important, and education and practice are more important than raw talent. No matter how much talent an artist has, it is squandered without learning and hard work, and the work is misguided if the artist does not follow his inspiration. Please note that the ancients often talked of an artist having a genius — a guardian angel who would breath in divine inspiration — and not being a genius as we say today. This is an important distinction. If inspiration comes from the outside, then personal creativity is not emphasized: here we both avoid narcissism (so common these days) as well as relieving undue pressure upon the artist, and so we could expect an artist to live a more healthy and harmonious life. Longinus admired Plato. In the Ion, Plato's protagonist Socrates debates with a dramatic actor in his typical ironic fashion. Socrates concludes that the poet's art has as its ultimate source a divine inspiration, like links of an iron chain being held suspended from a magnetic lodestone. The dramatic actor gains inspiration from the author of the text he is performing, as well as the acting tradition handed down from previous performers of that work. Longinus goes beyond this, stating that the inspiration of sublimity flows from the artist to the listener or viewer, giving them a glimpse of the source of inspiration. Intellectual arguments cannot do this, except over a long time and with much thought; sublimity can do this in an instant. Sublimity, if it is a virtue, then is one of the golden mean, opposed by the dual vices of bombast — excessive sublimity than what is called for — and puerility, which comes from narrow-mindedness, and leads to art which is pedantic and cold. Closely related is the problem of false sentiment, where art shows excessive or insufficient emotion. As he writes, “Now all these glaring improprieties of language may be traced to one common root—the pursuit of novelty in thought.” Kitsch is one of the dirtiest words in contemporary art (unless kitsch is used ironically), and novelty is highly valued; rather the artist ought to mine the arts of divers places and times, seeking inspiration, and then make it his own. If you want to be creative above all things, then you probably won't be novel; if you don't care about creativity, but instead seek higher things, creativity will likely follow. According to Longinus, aiming for the sublime is better than being merely clever in lower and meaner things. It is proper to observe that in human life nothing is truly great which is despised by all elevated minds. For example, no man of sense can regard wealth, honour, glory, and power, or any of those things which are surrounded by a great external parade of pomp and circumstance, as the highest blessings, seeing that merely to despise such things is a blessing of no common order: certainly those who possess them are admired much less than those who, having the opportunity to acquire them, through greatness of soul neglect it. Now let us apply this principle to the Sublime in poetry or in prose; let us ask in all cases, is it merely a specious sublimity? is this gorgeous exterior a mere false and clumsy pageant, which if laid open will be found to conceal nothing but emptiness? for if so, a noble mind will scorn instead of admiring it. It is natural to us to feel our souls lifted up by the true Sublime, and conceiving a sort of generous exultation to be filled with joy and pride, as though we had ourselves originated the ideas which we read. If then any work, on being repeatedly submitted to the judgment of an acute and cultivated critic, fails to dispose his mind to lofty ideas; if the thoughts which it suggests do not extend beyond what is actually expressed; and if, the longer you read it, the less you think of it,—there can be here no true sublimity, when the effect is not sustained beyond the mere act of perusal. But when a passage is pregnant in suggestion, when it is hard, nay impossible, to distract the attention from it, and when it takes a strong and lasting hold on the memory, then we may be sure that we have lighted on the true Sublime. In general we may regard those words as truly noble and sublime which always please and please all readers. For when the same book always produces the same impression on all who read it, whatever be the difference in their pursuits, their manner of life, their aspirations, their ages, or their language, such a harmony of opposites gives irresistible authority to their favourable verdict. I shall now proceed to enumerate the five principal sources, as we may call them, from which almost all sublimity is derived, assuming, of course, the preliminary gift on which all these five sources depend, namely, command of language. The first and the most important is (1) grandeur of thought, as I have pointed out elsewhere in my work on Xenophon. The second is (2) a vigorous and spirited treatment of the passions. These two conditions of sublimity depend mainly on natural endowments, whereas those which follow derive assistance from Art. The third is (3) a certain artifice in the employment of figures, which are of two kinds, figures of thought and figures of speech. The fourth is (4) dignified expression, which is sub-divided into (a) the proper choice of words, and (b) the use of metaphors and other ornaments of diction. The fifth cause of sublimity, which embraces all those preceding, is (5) majesty and elevation of structure. These principles of writing can easily be transferred to the other arts by analogy. The English word sublime comes from the Latin sublimis, which according to the Lewis and Short dictionary, means “uplifted, high, lofty, exalted, elevated” and “eminent, distinguished”. While the artistic use of the word sublime has been largely lost, the word is common in chemistry: we say that dry ice — frozen carbon dioxide — sublimates to gas; that is, the solid form of the substance goes directly to the gaseous form without first becoming a liquid. On the contrary, water ice first becomes a liquid before evaporating into the air. Early chemists used the word sublimis because of its analogy to the ascent of a soul from worldly to spiritual things. Based on this notion, psychoanalysts use the term sublimation to describe the process where baser emotions, such as desire or hurt, are transformed into higher things, such as charity and forgiveness. Spire of Saint Francis de Sales Oratory, in Saint Louis; this photo can be found in the book Catholic St. Louis: A Pictorial History, by Fr. William B. Faherty. An understanding of the sublime is found in Gothic architecture, which directs the soul towards heaven. As I mentioned earlier, the precise use of the word sublime has been largely lost and is now only used as vague praise. I argue that the notion or understanding of the sublime is widely and expressly found in Catholic art throughout the Church's history and in the Old Testament, as well as in mystical theology. Is not God, in our traditional understanding, sublime? If we consider Jesus to be just a nice buddy who offers us good advice, are we not missing the greater part of theology? Instead, consider the importance of Christ the King, the Judge Who will come at the end of the age, the Lion of Judah: this is sublimity. Longinus' book was preserved by monks and was rediscovered in the 16th century, and while allusions to it may be found in the Church Fathers, it gained great fame and importance from the 1600s through the 1800s until the advent of Modernism. This is an important book, and is worth reading; I find it delightful myself, and find that it makes much sense. It is educational as well as humbling and inspirational. But supposing now that we assume the existence of a really unblemished and irreproachable writer. Is it not worth while to raise the whole question whether in poetry and prose we should prefer sublimity accompanied by some faults, or a style which never rising above moderate excellence never stumbles and never requires correction? and again, whether the first place in literature is justly to be assigned to the more numerous, or the loftier excellences? For these are questions proper to an inquiry on the Sublime, and urgently asking for settlement. I know, then, that the largest intellects are far from being the most exact. A mind always intent on correctness is apt to be dissipated in trifles; but in great affluence of thought, as in vast material wealth, there must needs be an occasional neglect of detail. And is it not inevitably so? Is it not by risking nothing, by never aiming high, that a writer of low or middling powers keeps generally clear of faults and secure of blame? whereas the loftier walks of literature are by their very loftiness perilous? I am well aware, again, that there is a law by which in all human productions the weak points catch the eye first, by which their faults remain indelibly stamped on the memory, while their beauties quickly fade away. Yet, though I have myself noted not a few faulty passages in Homer and in other authors of the highest rank, and though I am far from being partial to their failings, nevertheless I would call them not so much wilful blunders as oversights which were allowed to pass unregarded through that contempt of little things, that “brave disorder,” which is natural to an exalted genius; and I still think that the greater excellences, though not everywhere equally sustained, ought always to be voted to the first place in literature, if for no other reason, for the mere grandeur of soul they evince. This is a dangerous passage if the ideas here are taken too far, if the reader is not anchored in orthodoxy. We must remember that the truly sublime must express what is true. Longinus wrote that a sublime author is like the champion of a pentathlon: he may be second best in each sport, but he is matched by no one in all five together; narrow specialists are dull people, incapable of the sublime. 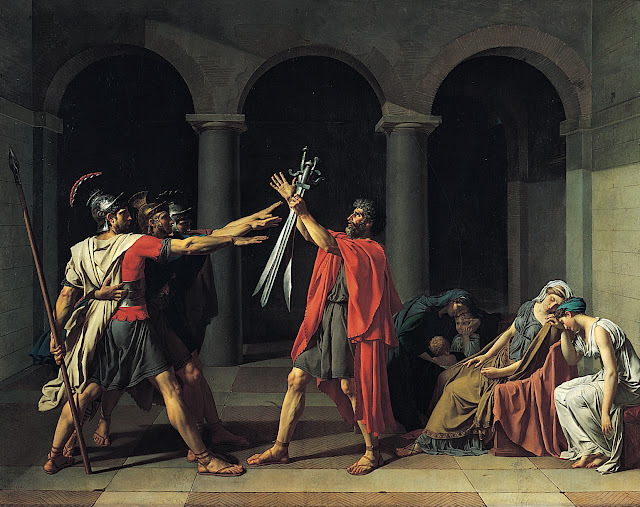 The hyperpatriotic Oath of the Horatii, by Jacques-Louis David, was commissioned by the King of France, although this painting was later used as a symbol of the Revolution. This painting shows the triumph of duty to the State over feelings. The three Roman brothers are going to do battle with three Curiatii brothers, even though one of the weeping women shown is a sister to the Horatii and betrothed to a Curiatius, and another is the sister to the Curiatii, married to a Horatius. But pure classicism is very cold, as the painting above shows. David originally was going to show the sole surviving Horaitus slaying his sister, who was weeping over her dead husband, but he thought that too gruesome, showing that pure rationality has its moral limits. But this did not stop David from voting to have his former patron executed. Pure rationalism is cold and heartless, and ultimately deadly. As mentioned, the rationalist philosophers who studied Longinus' book on the sublime had a cognitive disconnect. Sometimes Longinus said that a sublime writer had to follow rational rules of the writer's craft, and other times he said that sublimity came from what the rationalists thought was irrationality, like divine inspiration. When confronted with two seemingly contradictory facts, some thinkers will swing from one extreme to the other instead of trying to harmonize or moderate them. The Lady of Shalott, by John William Waterhouse, shows a noble lady fleeing an unusual imprisonment and on her way to Camelot, even though she knows that she shall soon die of a curse. The imaginative and romantic themes of this style of art have great appeal, and certainly can be called sublime. But the sublime is about lofty, great things, not just emotionalism. Sublimity's emotion has to be fitting emotion, and not to excess. And what is the purpose of sublimity? Is it for its own sake, or for something higher? Some philosophers strictly opposed sublimity to beauty, but I think that is a mistake. This led from lofty sublimity to something much worse: the embrace of the ugly and evil, something which Saint Augustine warned against. The ugly end of the Romantic movement was the Holocaust, and the grandchild of the movement is the slasher film, filled with gore. Most horror films, I am very sure, are not sublime, but they are logical consequences of the idea that feelings are all that matter. 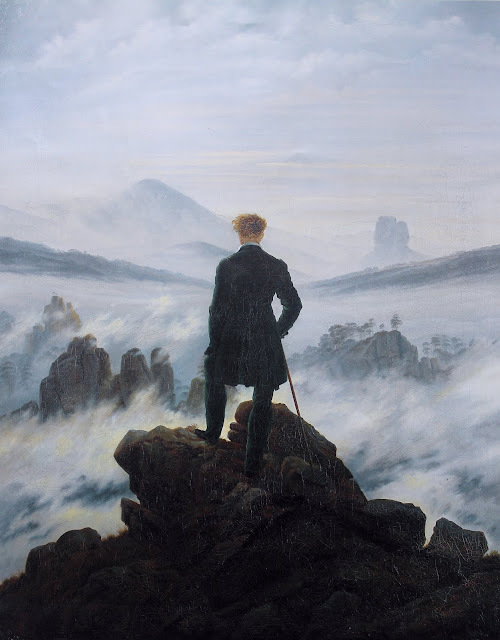 The Romantics, even though they embraced the sublime, also had a cognitive disconnect with Longinus — the Roman writer did say that there were objective rules that should to be followed; the sublime includes both Reason and Emotion. The Romantic movement was inspired by the Middle ages, but it was a view of the Medieval period divorced from Catholicism, and was specifically anti-Catholic. But how can you accurately portray noble knights unless you also portray the Blessed Virgin, to whom the knights were devoted? Although the glorious Gothic revival period was inspired by Romanticism, it too had the flaw of being about emotions, the feeling of spirituality. The Liturgical Movement of the early 20th century brought rationality back to the art of the Church, but it eventually failed and led to unedifying plain and even ugly churches, because it grossly failed to recognize the importance of the heart and beauty. 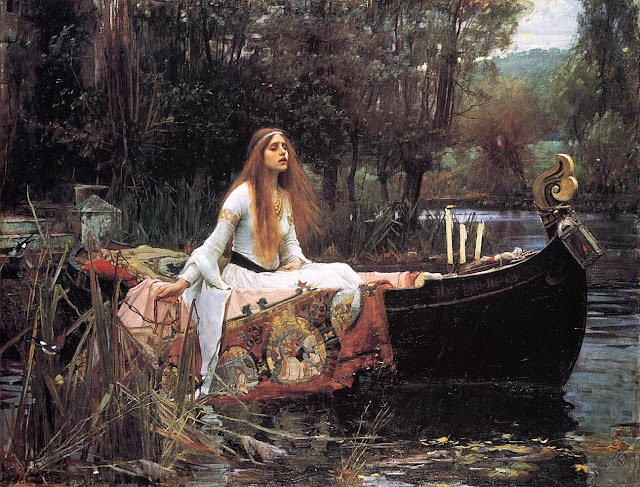 The Romantic movement often had fantastic themes, as seen in Waterhouse's painting above, and so was eventually opposed by Realism, which portrayed ordinary life in an unemotional way. This was inspired by photography. But Realism was opposed to the transcendental, and to the spiritual, and eventual embraced ugliness, very much like its supposed enemy. Realism failed to grasp the sublime, because it rejected beauty and divinity. The idea of sublimity largely died with the end of the Romantic movement, but philosophers have lately rediscovered the sublime. Some recent philosophers state that the sublime — strictly opposed to beauty — was the central idea of Modernism. I do not believe this, although the beauty part is very plausible. I fail to see the sublime in modern and contemporary painting and sculpture. However, other fruits of modernity, such as skyscrapers, vast mechanized militaries, and the overwhelming socialist State, are definitely very big and overpowering. But the wealthy executive in his corner office high above the streets of Manhattan, the powerful bureaucrat regulating life and death to a fine degree, and the nuclear weapon laying waste to a city, lack nobility, and are even ignoble. And so they are not sublime. We need to discard the ideas of the Rationalists and Romantics and instead take an integral approach to the sublime: faith and reason, reason and emotion, head and heart, genius and hard work, will and obedience, beauty and sublimity, skill and inspiration, talent and nobility, humility and greatness; all these things together in harmony.